Goshen Village Hall is located at 276 Main Street, Goshen NY 10924; phone: 845-294-1558. Photo: Everett-Bradner House, ca. lat 18th century, 156 South Street, Goshen, NY. Listed on the National Register of Historic Places in 2004. Photographed by User:Daniel Case (own work), 2006, [cc-by-3.0 (creativecommons.org/licenses/by/3.0)], via Wikimedia Commons, accessed January, 2014. The title to the land on which the village of Goshen is situated is derived from the Wawayanda patent. "The patent was granted by twelve Indian sachems or chiefs representing their tribes, some of whom, if not all, resided on the lands granted, or in the vicinity. This patent ... was confirmed in the then usual manner by royal authority. It is dated on the 5th of March, 1703, in the reign of Queen Anne," and contained the names of the twelve Indian grantors as well as the twelve patentees. At the time of the grant, it was said to contain approximately 150,000 acres and to include most of the present-day towns of Minisink, Warwick, Goshen, Wawayanda, and Hamptonburgh. From what evidence can be gathered, it was not until 1714 that the patentees and their immediate successors in title began to realize the effects of a resale of their land. In a deed of trust dated July 10, 1721, from John Everett, John Carpenter and others, to John Yelverton, mention is made of an earlier Goshen transaction. It said, in effect, that the owners of the Wawayanda patent "had lately made a conveyance" to John Everett and Samuel Clowes of one-sixth of all of their holdings with the intention of establishing a township. This township plot was divided into farms of varied acreage with roads which divided the area into what soon came to be known as East, West, South, and North Divisions. Approximately ten acres were set aside for a minister and by 1721, the Goshen Presbyterian Church was established with the Reverend John Bradner as pastor. As early as 1727, County Court sessions were held at Goshen, and it was designated a half-shire town, or a center of county government. On 16 November 1737, an act of the Provincial Assembly empowered the local justices "to build a courthouse and gaol for the said county at Goshen." 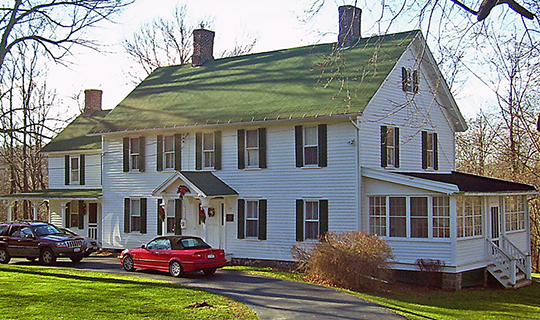 In 1773, a school was started in the village, at which Noah Webster served as the instructor in 1782. In 1790, this school became the nucleus for Farmers' Hall Academy. Goshen after the Revolution was not only the center of town and county government, but as a growing combination of taverns, businesses and private homes, was becoming the commercial focus of a fairly well developed agricultural community. The area contained several bustling taverns such as the Orange Hotel and Anthony Dobbins Inn where, "while courts were being held under the old custom, the judges were wont to march from the courtroom to their dinner and back, wearing their official robes." It was at a stable at Dobbins' Inn that the celebrated thoroughbred horse Imported Messenger stood about the year 1801, when it was common practice to hold impromptu races along the main straightaway for the benefit of tavern patrons and idling jurists. This, of course, was only the beginning of continued local interest in trotting stock, which eventually led to the siring of Hambletonian, the progenitor of all modern trotters, and the establishment at Goshen of the first American track devoted to their racing (National Historic Landmark contiguous with Historic District). Small commercial enterprises flourished along Main Street and records are full of references to businesses such as Smith's Blacksmith Shop begun in 1825 and Merriam's Hardware and Tin Shop founded in 1822. Some fine private dwellings date from this era such as the Wallace House and the Coleman House, which reflect an early Federal style of architecture. The dedication of the Minisink Monument on 22 July 1822 was another major event in the Goshen of the early nineteenth century. Crowds contemporarily estimated at 15,000 persons gathered to commemorate the losses of the Goshen militia in attempting to repulse the Indian raids led by Joseph Brant in the western section of the county. The original monument was replaced by a grander construction in 1862, but the original is now on view at the Orange County Government Center. Winawer, Lili and Golbrect, Lawrence E. (ed), Church Park Historic District, nomination document, 1979, National Park Service, National Register of Historic Places, Washington, D.C.